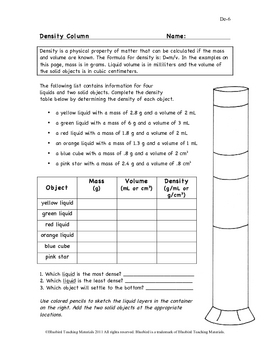 This one-page student worksheet teaches and reviews the concept of density. The worksheet defines density and gives the mass and volume of four different liquids and two solids. Students calculate the densities of the six substances and complete the density table for mass, volume, and density. They then answer three questions about the results and color the layers in the density column according to density. The one-page answer key is full size and is in color. 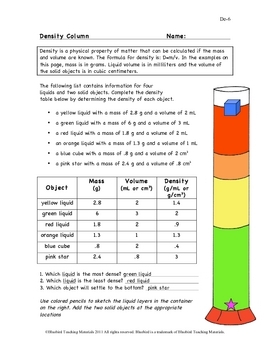 This worksheet is based on the California eighth grade science density standard, density and buoyancy (standard 8).